The Philadelphia Medical Examiner's office followed a fairly rigid policy with respect to case photos. If they took jurisdiction in a case simply to facilitate the issuance of a death certificate, then there existed no need for photos. That is to say, if the death was due entirely to natural causes where there were no medicolegal overtones involved, there would be no forensic need for photos to document that fact. However, if a person died under violent or mysterious circumstances, or if it were felt that there would be a need for the pathologist to testify in a court of law at some later date, photos would always be a routine part of the post-mortem examination to document the nature and extent of the external wounds or injuries. The Medical Examiner's Office had its own staff photographer who took scene photos wherever indicated in homicides, suicides, fatal accidents, etc. He was always on call to travel anywhere in the city at any time of the day or night, and he was expert at what he did. Following are color-tinted versions of some of the photographs that were taken of the unknown boy's body immediately preceding the two-hour autopsy that was performed by city medical examiner, Dr. Joseph Spelman. 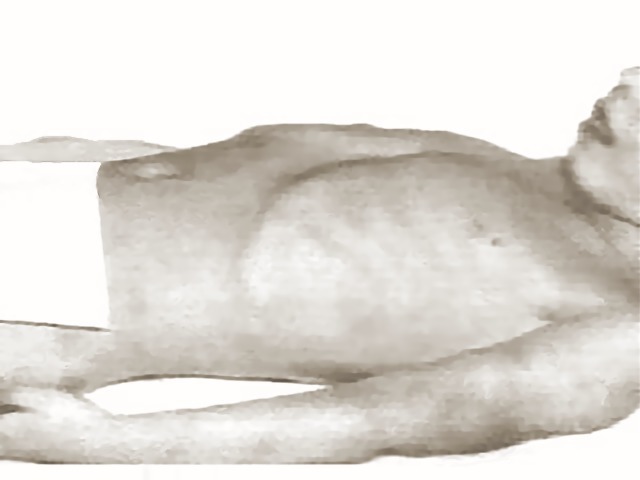 Lateral view of the boy's torso. Note multiple bruises on left arm, above elbow. Anterior view of the boy's torso. Though somewhat difficult to discern in this photograph, there were bruises on the boy's right arm and upper chest. Photograph of the boy's legs, showing massive bruises. It is unlikely that the boy would have suffered such extensive bruising merely through "rough play" or by accidentally falling. This condition indicated that the hand had been immersed in water for an extended period, either shortly before or after death. The soles of both feet were also wrinkled. Posterior view of the boy's head, neck, and torso. Although some lacerations were found on the boy's neck, the dark markings that look like bruises were most likely due to the post mortem phenomenon known as Livor Mortis, a purplish discoloration of the skin caused by settling of the blood to the lowest areas of the body after death. In the case of a body that has been lying face up, the blood will tend to settle in the nape of the neck, lower back, and buttocks. The boy's face. Note horizontal row of oval bruises on forehead. 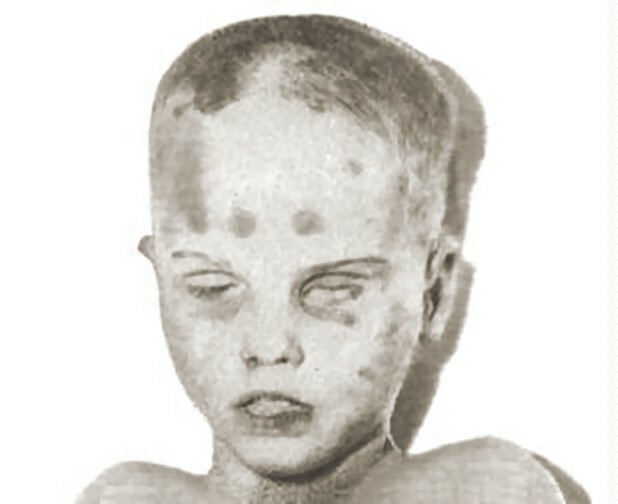 The location, spacing, alignment, size and shape of the bruises suggests the possibility that they were caused by strong pressure being applied by an adult human hand, perhaps while the individual was cutting the boy's hair. Close-up of right side of head provides a good view of the "amateur haircut" and row of oval bruises.